The Most Venerable Maduluwawe Sobhitha Thera, the Chief Incumbent of the Kotte Naga Vihara, has passed away at a private hospital in Singapore early this morning, the Sri Lankan Mission in Singapore confirmed. The Thera was rushed to a Singapore hospital on Tuesday (03) night due to a sudden illness. A government official said that they had decided to conduct the Thera’s funeral with full State honors. The remains of the Ven. 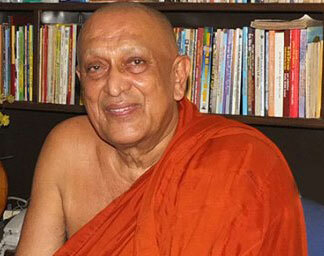 Sobitha Thera is to be brought to the country today. Sri lankan lost highly valued person. Very sad to know this news. An unbearable loss for the people of Sri Lanka. The curse of removing the dictator would have hurried him to this fate. This is a huge loss to our beloved country. It was through his foresight and guidance that our country could change its course towards "Yahapalanaya" which is upto the present leaders to continue properly. If some say that the war was won by MR then "Yahapalanaya" was won by this Very Venerable Thero. He did not contest but guided and no one says thathe won the war against a dictator. Similaarly, MR guided and he did not fight but guided and the armed forces fought. May he Rest in Peace. It is really sad news and a great loss to the people of Sri Lanka. A fearless leader who was instrumental in removing a budding dictator. My you attain Nibban. Great loss to the Country and for the people who fight for democracy and justice. May he attain the supreme bliss of nibbana. Your vision will always live. the greatest person who voiced for a just and equal society in Sri Lanka. will be missed dearly. may his soul rest in peace. Venerable Maduluwawe Sobhitha Thera you will always be remembered. The Government should at least now implement everything he desired, in his honour and to satisfy the yearnings of those who voted for it. A real hero among the fake politicians. May he attain Nibbana. The guiding light and the best hope of yahapalanaya extinguished. What a great loss for the country. He took disappointment at the theatrics of the players he backed to his grave, May he attain eternal peace. The legend of the voiceless.The Father for all Communities irrespective of Race, class or Religion.The Torchbearer for the so called minorities in a land we live of our own heritage. The Most Reverent who stood the tides of the Extreme groups within his own clergy. The savior of the Nation. The voice of the children of Mother Lanka .The most humble and Revered Monk who stood the tied of waves of the ruthless rule of the last regime, is no more in the land of the living .We pray that he be blessed the best of stations where ever the Humble Reverent be, and May his soul rest in peace in the most harmonious, joyful, contended manner, and may his memory linger in a History written in gold in Mother Lanka till we all depart from this world. A great loss for people who care about democracy, justice and good governance! Impossible to fill the void left! What a sad news? Great loss to the country at this crucial juncture. Most venerable thero fearlessly initiated the change of future direction of the political journey of Sri Lanka, anticipating a just society. May this noble goal for Sri Lanka be fulfilled soon. Venerable Sobitha thero, may you attain the supreme bliss of nirvana! God never allows good people to live long. I am not a Buddhist but I hope you will be reborn in this country as our President. Only then we shall have any hope. I am sure that people of all religions wish the same. We bless from our hart to atten Nibbana. Irreparable loss to the country.May he attend to the supreme bliss of nibbana. I personally have declared a week of morning for my great leader. We do not want a state sponsored week of morning. We ourselves have the respect to declare this week as a week on morning. I am so sad and down. He would have died of a broken heart looking at the traitors he mistakenly helped into power of the country he loved. Sad. Irreparable loss to the Country. R.I.P. A fearless leader who started the movement Sadarana Samajayak nearly 04 years ago in the heyday of MR regime and was the key personality in ushering in the revolution of Jan 08 , 2015 . May he attain the supreme bliss of Nirvana . You opened the eyes of the rational community of Sri Lanka. You were rewarded with the victory of January 8th with right thinking people backing you to lead Sri Lanka to a new era. Sadly the leadership of our nation have failed to take on your guidance to restore justice and eradicate rampant corruption. Your effort was not in vain as you have instilled into the thinking mind that change is always possible if a few good people gather together.Your memory will always live on in the hearts of every community in Sri Lanka. The very utterance of your beloved name must become a beacon of hope to every oppressed person in Sri Lanka who still cry out for justice in their motherland. You were a true faithful son of the soil who has brought pride to mother Lanka. A great leader who fought for democracy. His vision of a clean administration to Lanka faded, and he too faded. May he rest in peace. A very sad day for our nation. May you Rest in Peace. Revered Leader with the Nation at heart. Unfortunately silenced at the most important moment. Some sad , some happy. what ever it may be, nibbana is not close to this clergy. A great loss to Srilanka in the need of the hour. May he attain nirvana. Very sad to hear. We need people like you. Very shocking, Nelson Mandela of Srilanka. A Thero who dsacrificed his enitite life for the restoration of democracy and justice. Irreplaceable loss. For the mission the venerable undertook to reach fruition,everyone of the countrymen should strive to follow the righteous path that his/her religion teaches. What a great loss for the country. Ven. Sir, may you attention Nibbana! The government leaders should at least now try to implement the necessary changes to the constitution(totally abolishing the EP) and prosecute the wrongdoers without protecting them, the main wishes of Sobhitha Thera , instead of conducting the Thera’s funeral with full State honors. What a courageous priest who brought liberation to our country. Although you left us today the legacy you left behind will remain in our minds and hearts forever . May you attain Nibbana! Today we have a lost a great champion of democracy and justice. The void he leaves with his death will be hard to will. I hope the legacy he leaves behind will embolden the Sri Lankans to fight for democracy and justice a cause for which he fought until his last breath. Public has a right to know ven.theros illness.we have so many good doctors in srilanka and why he was taken to Singapore .? This trip may have deteriorated his condition. An exemplary monk. I wished if he lived long to advise leaders a lot in fairness! Who was responsible for taking Ven Sobitha to Singapore for Treatment?. Ven Sobitha was a nationalist and always upheld the people of Sri Lanka and the Professionals of Sri Lanka. He knew very well that Sri Lankan Doctors and medical staff at government Hospitals could have given him the best of treatment anywhere in the world. gr8 loss to the peace loving people of SL. it is not about religion or money or power or status. It is about how u lived and what good u did to others. he was a gr8 person who did good to this country and people. u will be remembered by all. We would like to know what was his sudden illness? it is our right to know. as we love him. Most Ven.Sobhitha Thera, your name one day write in SL history in Gold, as a most noble priest, who has done just society movement to this country to bring back prosperity. Most Ven Thera,You may attain supreme bliss of nabbana. Just understand the people press thumb down. All these people are confirmed entry to hell gates 4 ever.